Brazilian designers start delivering their Fall collections this month, and since I am going to Brazil in a couple of weeks, am already thinking of some little things that I might wanna invest in while am there (to support the national industry). 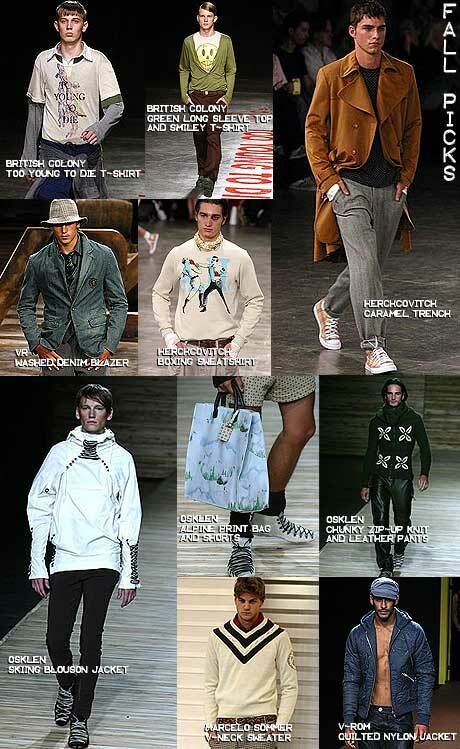 I loved everything by British Colony and Osklen... And this time around Mr. Herchcovitch put on a great men's collection, with a lot of good and easy pieces. Nothing new and hot from Forum this season? If you are gonna be in Sampa on April 15, heads up: Andre Almada is hosting the first anniversary party of TOY (his Friday party at The Week) -- it's being held at Hotel Unique. But not at Skye Lounge I take it, so rumor has it that this will be a big gay dance party in the lobby, the fabulous, cavernous lobby...3 DJs have signed on: Joao Neto (resident/Skye), Carlo Dall´anese (Sirena SP) e Mimi (resident/The Week).